Leila Alcasid first caught our attention when the internet started referring to her as Selena Gomez's doppelganger. 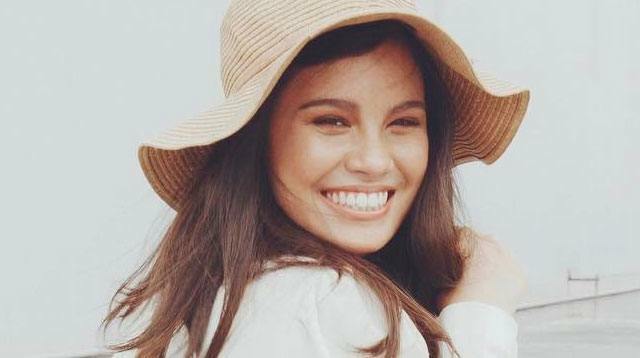 And indeed, after some inevitable Instagram stalking, it's hard to deny that the 19-year-old daughter of Ogie Alcasid with former wife and beauty queen Michelle van Eimeren does resemble the music superstar. But, make no mistake: Leila is her own person, and this talented and smart gal is so much more than just somebody's lookalike. Currently majoring in Government and International Relations at the University of Sydney, this next gen It girl is all set to make a name for herself. 1. "I'd take a food holiday over a beach holiday any day. Don't get me wrong—the beach is cool, but food is cooler. I'd love to visit Italy or Japan and try everything. I'd be in my happy place." 2. "I love literature. Reading and writing are my passions. I read books like it was an addiction from the moment I was old enough to comprehend the story, and started writing my own once I had the technique down. English was my absolute favorite subject." 3. "I'm a family girl through and through. I love traveling with my family because it's so comfortable and familiar. Even at home, I'd pick relaxing with them over going out. Plus, my family is just the coolest." 4. "I did equestrian for several years when I was younger. I had my start here in the Philippines at the Manila Polo Club and continued when I moved to Australia. I loved it sooo much, but sadly, [I had to] quit when I got a bit older." 5. "I have a secret obsession with buying clothes and online shopping. I don't even always need to but I am addicted to shopping and evolving my style. I've had to tone it down a little though since saving money is a necessity for a pesky millennial like myself." 6. "I'm the kind of person that needs to have everything organized and laid out in front of me, otherwise I get super stressed. Even in life, I need to have a life plan so I can feel at ease." 7. "I'm a night owl. I stay up late most nights watching a TV series or a film, or just stalking on Instagram. It isn't necessarily a good thing, but my whole life I've been a late sleeper." 8. "I prefer pants and shorts to skirts and dresses. I'm always way more comfortable, although a pretty dress is fun for a special occasion." 9. "I like to surround myself with a lot of friends and loved ones when I can. I prefer when there's more people around because I never wanna feel alone. Alone time is good and even healthy, occasionally, but I prefer being a social butterfly." 10. "I wanna grow up to be just like my mother. She's the epitome of everything I believe in and everything I wanna achieve. If I reach 50 and I'm just like her, I'll be happy."